In 10-inch nonstick skillet, break up ground beef; sprinkle with peppered seasoned salt. Cook over medium-high heat for 5 to 7 minutes or until beef is thoroughly cooked, stirring frequently. Drain. Stir in bean salad, reserved 2 tablespoons liquid from salad, the tomatoes and salad dressing. Arrange salad greens in 2-quart shallow serving bowl or on individual plates. Spoon beef mixture over greens; sprinkle with onion. 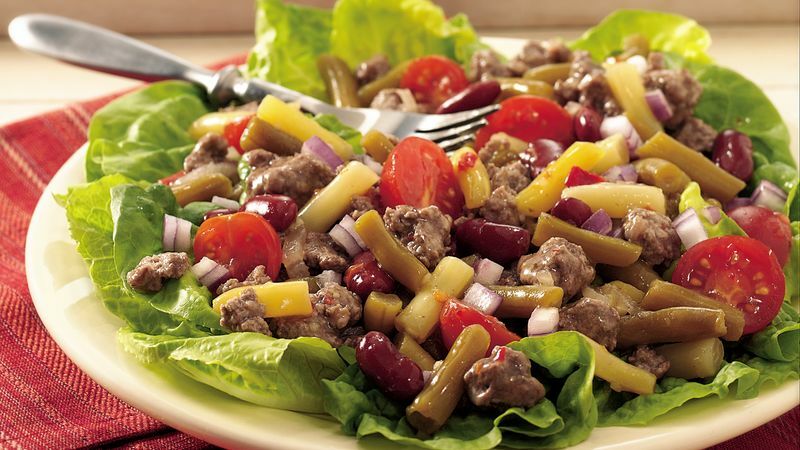 You could use three-bean salad from the deli instead of the canned variety. You can cook and drain the ground beef up to 8 hours in advance. Refrigerate until serving time, then reheat in the microwave just until warm and add the remaining ingredients. Pick up some fresh sourdough bread at the bakery to slice and serve with this tasty salad.